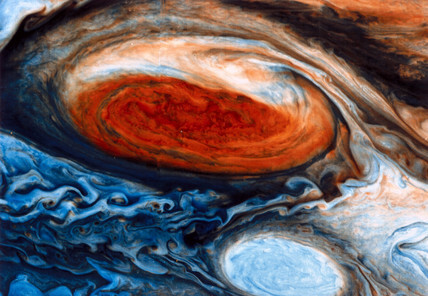 This photograph taken by Voyager 1 shows a close up of the Great Red Spot on Jupiter, a storm that has been raging in the gas giant's atmosphere for at least three hundred years. The white spot shows another cloud system that is believed to have formed around 1940. Jupiter's atmosphere is made up of 90 % hydrogen and almost 10 % helium, together with traces of other gases, including methane and ammonia. Immensely strong winds occur, and the storm clouds exhibit colours which are thought to be due to chemical reactions in the atmosphere. The two Voyager spacecraft were launched in 1977 to explore the planets in the outer solar system. Voyager 1 flew past Jupiter at a distance of 278,000 kilometres in March 1979 before flying on to Saturn.